Turtonator discards energy from any of your Pokemon, not just from the active. This is really cool if you can get a couple of Blaziken going, or Zinnia in hand with Fiery Flint. Turn 1 Kiawe onto Turtonator is absolutely BUSTED! I was really surprised the first time I went to attack and seven energy came up instead of three. I bet my opponent was too when I OHKO’d the Neganadel GX he thought was going to be completely safe from me. Even better, I still had two energy left on the active Turtonator. Unfortunately, I underestimated my opponent and he was able to KO my Turtonator and leave me with zero energy on the board. That’s going to be the trick with Turtonator – you want to leave the energy on the active if you can, but at 110 HP, chances are that active Turtonator won’t get a second chance to attack. But a turn one Kiawe followed up by a turn three attack puts an AMAZING amount of pressure on your opponent. Think about it – if you can attach turn one or turn three AND hit the Kiawe in turn one, you can OHKO ANYTHING IN THE GAME ON TURN THREE! This is pretty impressive, and I won a couple of matches with this alone. I haven’t completely figured Turtonator out yet, and I’m sure someone else will come up with the perfect list for Turbo Turtonator, but this card is way better than any of us thought it would be, and it could make it to top tier status at some point. There is definitely a decklist out there for Turtonator. I’m thinking it might also involve Ultra Beasts and Beast Ring, maybe Darmanitan, definitely Blaziken, Fiery Flint and Zinnia, maybe even Dragonair (SUM). I don’t know what it is for certain, but I do know that Turtonator is definitely arrow pointing up. I would highly recommend giving it a shot, and they’ve definitely come down in price, all Dragon Majesty card prices have fallen back to reasonable amounts on PTCGO. Last minute update: I have found a better list. It’s not perfect yet, but it’s pretty darn good… like maybe even Tier 1 archetype good. You can check out the video I posted on it here. Seriously – we ALL missed on how good Turtonator just might be. Some decks want to go for intricate combos. Others want to build things up over time before sweeping through an opposing team. And still some others want to load up into one big Pokemon and explode. And for Fire decks, Turtonator is that option. Turtonator is a Basic Dragon Pokemon, 110 HP, with a Fairy Weakness, no Resistance, and a Retreat Cost of 3. He only has one attack in Explosive Jet, which costs 3 Fire Energy and lets you discard any amount of Fire Energy from your Pokemon, dealing out 50 damage for each one discarded for this attack. Note that this doesn’t have to be on Turtonator, it can be on any of your Pokemon. Time for quick maths! 50 damage per Energy can stack up pretty quickly. 3 Energy can hit 150 damage, enough to OHKO most Stage 2 non-EX/GX Pokemon. 4 Energy does 200 damage, which can OHKO a lot of Basic EX/GX. And finally 5 Energy does 250 damage, which is enough to one-shot anything in the game unboosted. So ideally 5 Energy is what you need – and that’s not easy to cycle back very quickly. Funny enough, a lot of the Fire Pokemon in this set are actually built around adding lots of Fire Energy to your hand and then exploding it out onto the field. Charmeleon can mill off cards and get you a bunch of Energy if any are Fire Energy, Darmanitan can boost the field with Heat Assist, and Reshiram-GX can accelerate Energy onto itself with Flame Charge. On top of that, you’ve got Fiery Flint to burn out more Fire Energy from your deck and Blaziken to cycle them from the discard pile. The main problem then comes from doing it all consistently to boost Explosive Jet, and that’s where things get tricky. Fiery Flint costs you two cards from your hand to play, and Charmeleon can mill out other cards aside from Energy, effectively ridding you of some valuable resources to maybe get some Energy into play. Darmanitan and Reshiram-GX have to attack in order to accelerate Energy, though Darmanitan can power up Turtonator in one go, and Blaziken is only able to get out 1 Energy back for each Ability in play, and as a Stage 2, you’re not likely running a whole 4 set. Possible, but not likely. Overall, Turtonator’s got a lot working for him and against him, but Explosive Jet is a move that can definitely take opponents by surprise – and the best part is, he’s not weak to Water! Arora Notealus: Turtonator is a strange Pokemon indeed. A fire-breathing turtle dragon with a spikey back as his main quality? What a strange thing. That and he looks funny for a Fire/Dragon Type. Turtonator (Dragon Majesty 50/70) has caught the eye of one reviewer that made him pick this as his top pick, so let’s see what it can do! One thing to notice is that Explosive Jet costs RRR, so outside of Kiawe and Blaziken, there’s not much acceleration for Fire energies. The attack states that you can discard as many Fire energies attached to your Pokemon, and it does 50 damage for each energy discarded. You’ll need five energies to OHKO anything in the game. With Altaria and Choice Band, you can soften up to discard just four Fire energies from your Pokemon. In terms of what cards that can recover energy for you, in Standard, you got Blaziken (Dragon Majesty 6/70) whose Firestarter ability puts a Fire energy from the discard to one of your Benched Pokemon. In Expanded, you’ve got Blacksmith that puts two Fire energy from the discard pile to one of your Fire Pokemon. This is what I can think of when recycling Fire energies. It is important to know the limitations, though. 110 HP won’t make it last too long, and Dragons don’t exploit weakness except for BW-era dragons. Overall, it hits hard, but it needs support. Conclusion: I tried to make it short as I can, but Turtonator does only one thing, and it sometimes do it well. As long as you got something that can recycle energies, then you can consistently do the same amount of damage as you previously did. We’re doing something familiar this week, but with a twist: runners-up based on the highest ranked card from our INDIVIDUAL reviewers’ lists that did NOT make the site’s Top 5. These are the cards that one reviewer thought quite highly, but everyone else either had it low or left it off their personal lists entirely. We had four individual top pick lists submitted for Dragon Majesty, so it worked out perfectly to do this. If you’re wondering, Wednesday will be the one from my list, while Thursday’s CotD is a Throwback unrelated to the Dragon Majesty. Turtonator (Dragon Majesty 50/70) is our first pick this week. 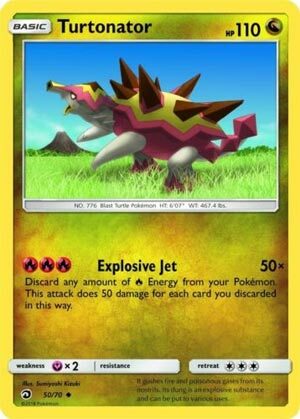 It is a Basic [N] Pokémon with 110 HP, [Y] Weakness, no Resistance, Retreat Cost [CCC] and one attack; for [RRR] it can use “Explosive Jet” to discard as many [R] Energy as you want from any of your Pokémon in play, doing 50 damage per Energy discarded in this manner. The good news is that it is big for a “glass cannon”, but the bad news is that its Energy needs are also high for an EFFECTIVE glass cannon. This contradiction is expressed in other places as well; it is a Basic Pokémon so it is easy to include just about any deck but that [RRR] Energy cost means it is hard to include in all but a few decks. Being a [N] Type opens up some great support BUT I’m not sure if it really uses that support all that well. You can discard [R] Energy from anywhere, but with that Energy cost, how many decks will have [R] Energy elsewhere? Likewise, if you leave too much on Turtonator, it won’t last because then Turtonator is worth KOing instead of something more strategic on your Bench because it isn’t like Guzma rotated. Turtonator’s best shot at finding success is probably as part of an opening gambit when you’re going first or as a sweeper, but only for decks that can at least pay for Explosive Jet, and preferably while having at least a little extra [R] Energy in play. Explosive Jet can be used to OHKO anything in the game – at least before protective effects – but the price scales up with that damage as well. I like Turtonator best as a late game sweeper or as one of the main attackers in something that can easily accelerate [R] Energy. I’d LOVE to see it revive Team Magma’s Camerupt (Double Crisis 2/34) decks or Emboar (Black & White 20/114; BW – Black Star Promos BW21; BW – Next Destinies 100/99; BW – Legendary Treasures 21/113) decks in Expanded… though any strong [R] deck could include it thanks to Blacksmith. A few decks might even make it work via Counter Energy – Explosive Jet doesn’t restrict itself to Basic Energy cards. For the Standard Format, a T1 Kiawe onto Turtonator means that it can OHKO something with 200 HP or less on the next turn… assuming you can safely promote it and there’s a target worth the trick. This combo IS risky; Tapu Lele-GX => Guzma => Double Colorless Energy becomes an easy counter combo UNLESS you intentionally short yourself an Energy from Kiawe… which in turn means you have 50 less damage to work with for Explosive Jet. Still, if it will give you a strong lead (or just set you up to win), it’ll probably be worth it. I actually fancy Turtonator as a sweeper, myself; you’ll still need some Energy acceleration and Kiawe won’t cut it, but you can drop it and push for that final Prize… so it doesn’t matter if you just used up EVERY Energy you had in play. Which is a great way to use Turtonator in the Limited Format, assuming you find a way to use it in the Limited Format; I don’t think Dragon Majesty released in a way you could run a sanctioned, Limited Format tournament with it.